Administration Touts Lower-Than-Expected Obamacare Premiums : Shots - Health News According to a report released by the Department of Health and Human Services, "premiums nationwide will ... be around 16 percent lower than originally expected," and 95 percent of uninsured people live in a state with average premiums that are lower than expected. Department of Health and Human Services Secretary Kathleen Sebelius says "6 in 10 Americans who currently lack insurance will be able to find coverage that costs less than $100 a month" in health insurance exchanges set to open next week. 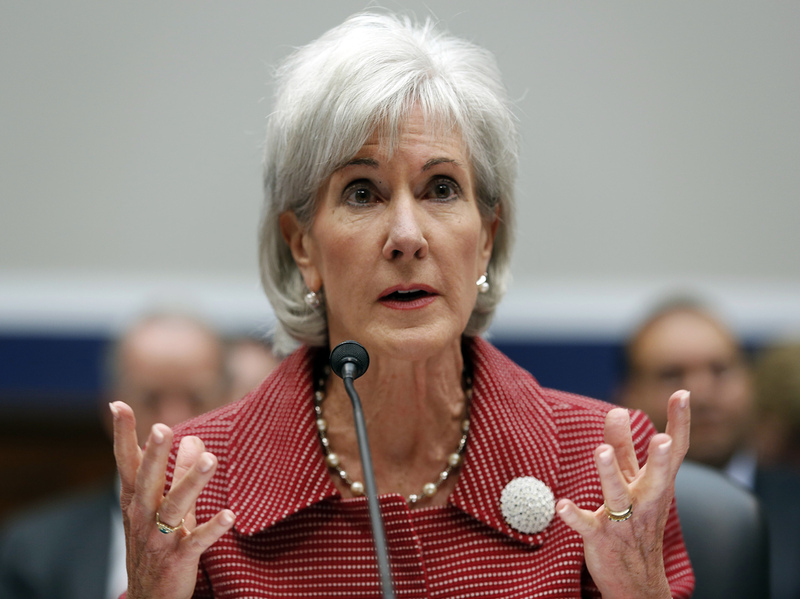 Here, Sebelius is shown testifying on Capitol Hill in June. Premiums in the health insurance exchanges set to open next week will be lower than anticipated, the Obama administration announced Wednesday. According to a report released by the Department of Health and Human Services, "premiums nationwide will ... be around 16 percent lower than originally expected," and 95 percent of uninsured people live in a state with average premiums that are lower than expected. But while the premium "rate shock" that many predicted may not be materializing, there may be other things about the new health plans that consumers may not like that much. Until now, the only premium information that's been released publicly about the Obamacare exchanges has been for states running their own, and in many, the rates have been lower than expected. Now, however, the administration has released information for the 36 states where the federal government will operate the new exchanges in full or in part. "Six in 10 Americans who currently lack insurance will be able to find coverage that costs less than $100 a month," HHS Secretary Kathleen Sebelius told reporters in a conference call. And in some cases, available tax credits can make health insurance really inexpensive. For example, said Sebelius, "Dallas families earning $50,000 a year will be able to buy quality coverage for as little as $26 a month." One reason for the lower-than-expected premiums is higher-than-expected participation by insurance companies. All year, it seemed that many insurance companies would stay on the sidelines, at least for this first year of the program. A few states and some counties within states will only have spotty competition. But administration officials say people in the 36 states where the feds are in charge will have an average of 56 different plans to choose from, offered by multiple insurance companies. And competition is key to those lower rates. "Parts of the country that have a number of insurers participating and competing for business, are coming in with lower premiums," says Larry Levitt, a senior vice president at the Kaiser Family Foundation, who's been studying the development of the exchanges. "So the market appears to be working." But it seems that another reason that the rates are lower — at least some of them — is that insurance companies have limited the size of their doctor and hospital networks in some of the cheaper plans. "The lowest-cost plans are coming in a lot lower than people were predicting, because the networks are coming in with a lot fewer doctors and hospitals than people were predicting," says Robert Laszewski. He's an insurance industry consultant and longtime observer of the health care system. Because the law requires all insurers to basically offer the same package of benefits, varying the size of the network was about the only tool they had left to try to create a less expensive plan. "For example, in California, the lowest cost Silver plan is one that has only about half the doctors and hospitals that particular health plan has in their standard employer network," says Laszewski. Silver is the second cheapest plan among bronze, silver, gold and platinum. Laszewski says that for people who are currently uninsured, these more limited network plans will probably be just fine. But for people who have been buying their own insurance, or if they've had employer-provided insurance, they're likely used to having a freer choice of doctors and hospitals. And they're going to find that comes with a price. "You're going to have to pay $100, $150 a month more than that to be able to get access to those kinds of networks," he said. Administration officials, however, dispute the idea that consumers will rebel against the plans with the narrower networks. Gary Cohen, the official at HHS who is overseeing the exchanges, told reporters that state insurance officials have a long history of regulating insurers — making sure that their networks have enough doctors and hospitals to provide adequate care. "They certainly don't want to get a bunch of phone calls from people who have health coverage but can't get health care," he said. Still, the data released by the administration likely won't settle the premium fight once and for all. The numbers are all averages. The premium individual consumers will pay will depend on where they live, how old they are, number of family members, household income and other variables.